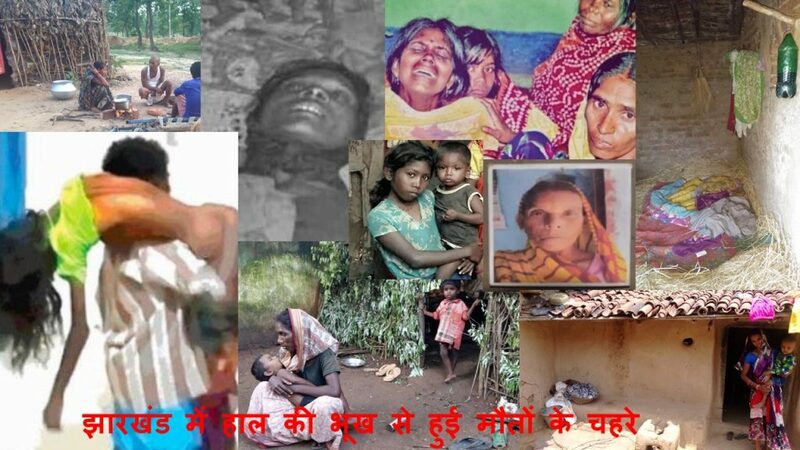 Since 2014, people of Jharkhand have faced severe attacks on their mere right to life by the Raghuvar Das led BJP government. The government has been trying to acquire land of Adivasis and Moolvasis against their wishes that will directly affect their livelihoods. On the other hand, there is also a direct attack on the people’s freedom to religion leading to killing of Muslims and Adivasis in the name of ‘cow protection’. At the same time, there is negligible focus on welfare programmes such as the Public Distribution System and social security pensions that has led to a spate of starvation deaths in the state in the recent past. At least 12 persons have succumbed to starvation since September 2017. The immediate causes of these deaths include denial of subsidised rice due to absence of a ration card, cancellation of ration card not linked with Aadhaar and failure of Aadhaar-based biometric authentication at the ration shop. It is true that some starvation victims were also ill, but they would probably not have succumbed to the illness if they received adequate nutrition and medical care. Denial of social security pensions and absence of work under the National Rural Employment Guarantee Act (NREGA) further contributed to the destitution of the starvation victims and their families. For every person who has died, hundreds other languish with hunger, undernutrition and illness. While the starvation deaths expose the lack of political commitment of the state government towards people’s welfare, the various tactics used to acquire one of the biggest assets of people, land, are also telling of its anti-people motives. Despite widespread protests against amendments in the land acquisition act, the government kept pressing for the amendments which have finally been approved by the President. The most crucial amendment is the waiving off of social impact assessment (SIA) for government acquisition for specific ‘public’ purposes such as setting up schools, colleges; railway line and electrification and so on. For such purposes, the government empowers itself to forcibly acquire even fertile multi-crop land. Social and environmental impact assessments are to be done by independent agencies and their reports are to be placed before the concerned Gram Sabhas for consent. Waiving off the assessments will make it easier for the government to acquire land without people’s consent. And it is only a matter of time before the government uses this amendment to acquire land for private institutions of education, health etc. The state government has also marked common lands of Adivasis and Moolvasis (such as rivers/rivulets, village roads, ponds, places of worship, burial grounds and so on) as part of “land bank” without the consent of the respective Gram Sabhas. The bank consists of 20.56 lakh acres of land across the state. Of this, 10.56 lakh acres are already earmarked for corporates with whom the government signed MoUs during Momentum Jharkhand. And 81 per cent of this area falls in the Fifth Scheduled Area. Forceful acquisition of land will have a direct impact on the livelihoods of the Adivasis and will literally violate their right to life. Not to mention, this is also a direct attack on the Adivasis’s constitutional right to self-governance. The government is also repressing voices of dissent. Damodar Turi, convenor of Visthapan Virodhi Jan Vikas Andolan, was arrested on 15 February 2018 on charges of being member of the illegally banned Mazdoor Sangharsh Samiti (MSS) and for celebrating the anniversary of the Russian Revolution. There are also growing incidences of communal violence in the state. At least nine persons were lynched in the name of religion or cow protection in the last four years. Recently, two Muslim youths, accused of stealing buffaloes, were killed by a mob in Godda. In June, Nagri and Bero blocks of Ranchi also witnessed communal violence. Notify rules of Panchayata Extension to Scheduled Areas Act (PESA) and implement the act in its true spirit. Ensure criminal action in all the cases of lynching and mob violence in the state.